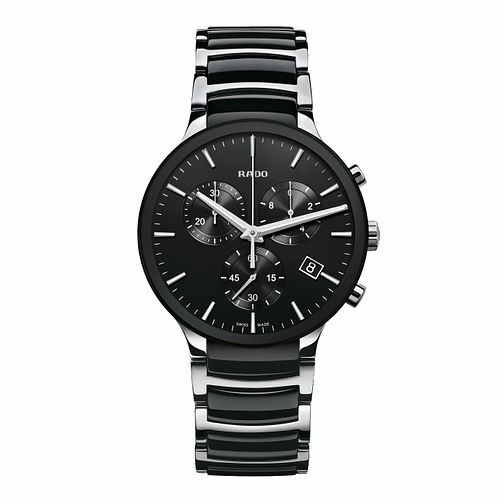 Rado combine quality Swiss watchmaking and sharp, contemporary designs to create simplistic premium watch wear. This stylish men's timepiece boasts a sleek pairing of stainless steel and black ceramic, set with a round, black chronograph dial. With a hint of futuristic design, this watch is perfect for the modern man. Rado Centrix men's steel & black ceramic bracelet watch is rated 5.0 out of 5 by 1. Rated 5 out of 5 by Anonymous from Amazing watch A spectacular buy.. great service..very happy with the purchase.